I had a guy from an electrical contractor out today to give me a quote on a couple of things. 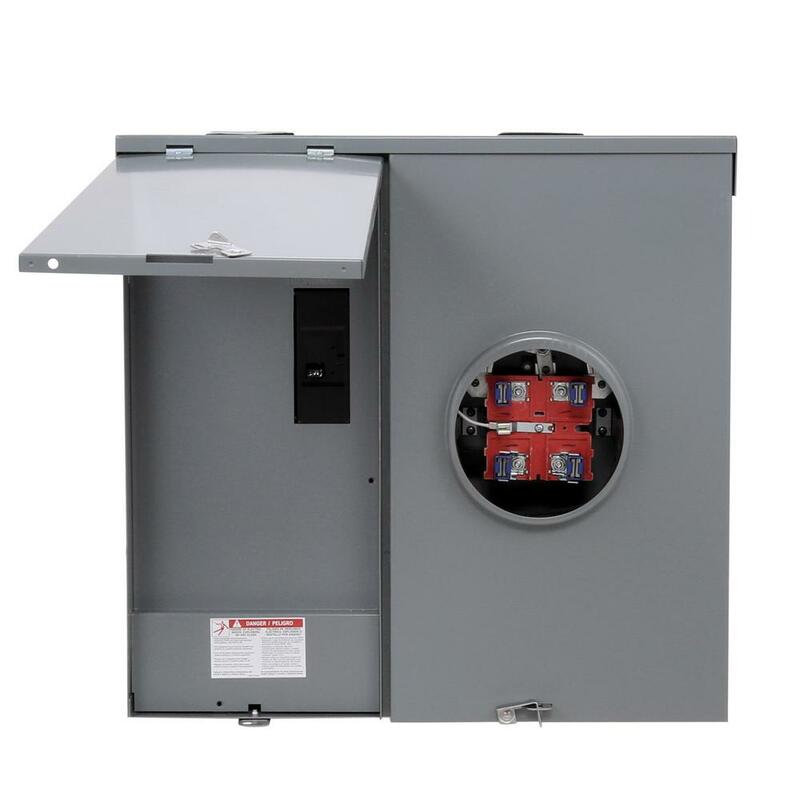 Lets talk about the single breaker box that will be outside by the meter base. He told me that I would have to come out of the breaker box inside the home & run a line to the outside single (sub panel?) outside. He says I can NOT come out of the meter base with more than one line which goes to the breaker panel inside the home. In short, I can not come out of the meter base & run a line to the breaker box & another to the single breaker box outside (sub panel?). I did this before on our old home in 2001. Below is the exact setup that I am wanting to do. As you can see, that is exactly how I did the other. Entergy came out & pulled the meter and let me hook up the single breaker box into the meter base... while the meter base is also feeding the breaker panel inside the home. The electrician says I can not do it this way. I say, I can cause Entergy pulled the meter base, let me hook it up & put the meter back after I was done. He was there the entire time. Maybe 30 minutes. I had much better pics of this but they were too large. If I can find another, I'll post it. Why is he prying on the fascia board ?? Thats me several years ago, replacing some bad boards. Codes and POCO's allowable practices change over time. Issue now is that each panel is a service disconnect and they need to be at one location. Power company workers are not familiar with the NEC electrical codes are their installations are not covered by the NEC. I am also surprised that they reconnected the new installation without you getting an inspection. The disconnecting means are required to be grouped together. I dont understand this but by the way both of your posts are written, I am assuming, what I am asking to be done, is not legal, correct? Or should I say not to code & not allowed by the NEC. Adding another voice into the mix - I too agree that having 2 panels, separately connected to the meter, in two different locations is not code-compliant. To think about it logically, NEC requires you to be able to shut off all the power to the building from one location. In your situation, you'd need to go to two locations to do it. You'd need a 2-breaker panel at the meter location, one breaker feeding your subpanel in the house and the second going wherever it goes. Depending on the size of the panels and the feeders, you could potentially have a single disconnect feeding both panels, but I don't think you'd gain anything with this solution. Correct. It is not legal nor is it code compliant. A relatively easy fix would be to install a main panel outside next to the meter and feed the inside panel off the outside panel. Thank you Zorfdt. That made sense. Tolyn, thanks for your explanation too. To answer both of you guys question, I need a new panel inside to supply the house because the existing one is old & is a two wire system... a black wire & a white... no ground. Its grounded at the meter. Therefore no outlets or switches in the house are grounded as such. Yes, in a sense they are but, there is no ground wire in the house. So you understand that. I just want it up graded because its old & outdated. The breaker panel only has 12 spaces. Two of those is a double for the AC/Heat unit. One is for the pump & shop. Yep... one for both. That leaves too few breakers for the whole house. A 1450 sq ft, three bedroom 1 & 1/2 bath. So, I need more spaces & an upgraded, new panel. The sub panel that I want outside is so I can run electricity to the shop where I will put a breaker panel, for lights, outlets, 120v wire welder, air compressor, stand up drill press, table saw, a 220 for a stick welder, etc, etc. I just wanted a sub panel connected to the meter base, then out of the sub panel, run plastic pipe under ground to the shop & connect to a new breaker panel there. All with new 12/2 romex (black, white & ground). As it is now (when we bought the house) they only have one run of romex (2 wire - black & white, no ground), over head, through a tree, to the shop. I just want something safer than that. So, the breaker panel in the house will be for the house electrical system. The sub panel outdoor will be for the shop & probably the water pump/well system. Tolyn, actually, the contractor today wanted to put a new breaker panel in the house, put in a breaker extra, then run a line from that breaker, through the wall to the sub panel outside, then run the feed to the shop. Just the opposite (but same thing) as you suggested. Hi, what is the purpose of the subpanel outside? Why not install a new panel inside and feed the shop directly from that panel. Changing the panel will do nothing as far as grounding the rest of the house if it’s all wired with 2 wire cable. Geo, I think posts 9 & 10 answers your questions. I think. I just don’t see the need for the sub panel outside, everything could be fed from the one panel in the house. Geo, also without getting into another phase of this project, in this thread, I am going to have the whole house rewired, one room at a time with new wiring... 12/2 (black, white & ground). So, the shop will be on the 12/2 wiring early on. Thanks Geo, & its possible that I am over thinking this & is why I am asking for advice. I need at least a 60 amp breaker for the shop minimum. My stick welder pulls 50 amps alone. If I am using the welder, plus lights & whatever else I maybe using at the same time, I need enough to feed the service. I'd like to have a 100 amp breaker just for the shop alone. Id rather have too much & be sure, rather than having too little. This might be a good situation for a meter/main combo (CSED) panel. It replaces your meter box with a unit that has a meter socket and a few main breakers integrated into one unit. This allows you to feed several different panels or outbuildings from the meter location without having to run large feeders in and out of the house panel. I need at least a 60 amp breaker for the shop minimum. My stick welder pulls 50 amps alone. Remember that the welder probably only draws 50 amps at it's highest setting and most people I know with welders at home rarely, if ever, have used their highest setting. OK, back to this thread. mounted on then outside wall rather than a sub panel outside, run plastic pipe out of the bottom of the conduit body, down the wall, then underground to the shop (then install a breaker panel out in the shop etc). Do I just have the electrician drill a hole through the brick wall, stick this conduit body inlet in the brick & attach fasteners? I mean, do I want to have him drill a 1" hole in my brick wall to mount this? Is that what you would do? Or would you use another type of box to come out of the wall with the Romex..... properly..?? You can't run normal NM cable outside, even in conduit. It is not rated for wet location and all conduit outside is considered a wet location. Hi, have him drill the hole but you won’t be able to run NM-B in the pipe it must be THWN conductors, so the pipe must be a complete run from panel to panel. You could install a weather proof box instead of the LB and change the NM-B to THWN. So I cant run this out doors in 1" plastic electrical pipe, buried under ground? And the plastic pipe has to be one continuous run. I cant run like 20' joints of pipe connected & glued? Ok great thanks for the advice Geo. I appreciate it. IF you want to run NM cable outside you need to use UF. Thanks Tolyn. I'll get that for the outside & use the other for re-wiring the inside of the shop. Thanks a bunch. I appreciate it. You cannot run jacketed cables like Romex in conduit. But, do I understand correctly what you are trying to do now? You want to bring a S.E. cable from your outdoor meter to an indoor load center ("main panel"). Then bring a cable from the indoor load center, back outdoors and to a exterior mounted load center ("sub panel"). Do I understand that correct? If so, this plan is a bit backwards, don't you think? Then you bring a S.E. cable into your house and put your loadcenter indoors (which is techically a "sub panel" now). The only difference between a main and a sub is that your neutrals and grounds are not bonded together in the sub. My main panel looks like this. It is outdoors. It only has space for one 200 amp breaker. That breaker can shut off power to my 200 amp indoor loadcenter. This way, I can work on my indoor loadcenter without risk of touching a hot lug or busbar and dying. It cost me 1000 bucks including materials and installation by a licensed electrician + passed town inspection. However, if you have need for additional outdoor circuits, you can find plenty of "Meter Main Combo" units that have space for 8 or 16 breakers. I am glad you are not trying to have your meter directly connected to both panels anymore. That was a worse idea. There is supposed to be 1 main panel. That is the one and only service entrance; that is the only place where neutral-ground bonding must occur; that is the place where the primary service disconnect must be.